Full-service turnkey water solutions when and where you need them. Mahaffey offers complete turnkey water services for disaster relief or military and industrial base camps. What We Offer: Immediate, nationwide delivery. Quick Response: By working together, we can mobilize to your location in as little as 2 hours. 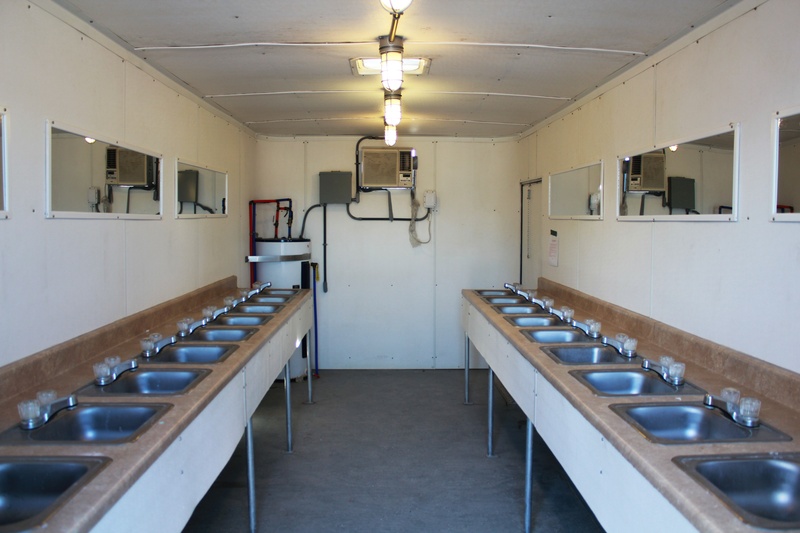 Mobile shower trailers are available with quick-connect electrical, water, and sewer connections for rapid installation. Portable shower trailers are equipped with wash basins and mirrors, in addition to shower heads. Individual shower stalls are plumbed and segregated. Mahaffey can also provide potable water supply and storage, water recycling systems and wastewater storage and removal to suit any application. 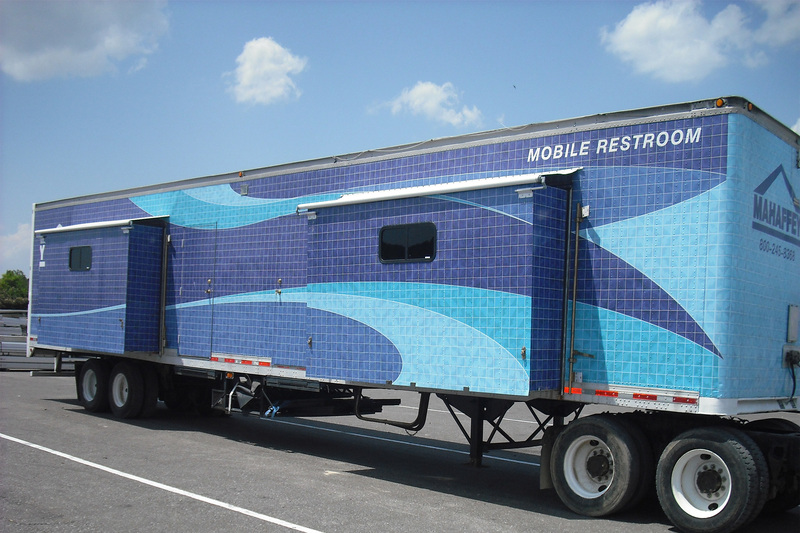 Depending on the need and utilities available at your site, Mahaffey can provide a range of mobile restroom trailers. Trailer options include HVAC, sinks with faucets and mirrors, water heaters, private doors and courtesy outlets. The units also feature potable water connections and gray/black water discharge valves that allow for rapid installation. 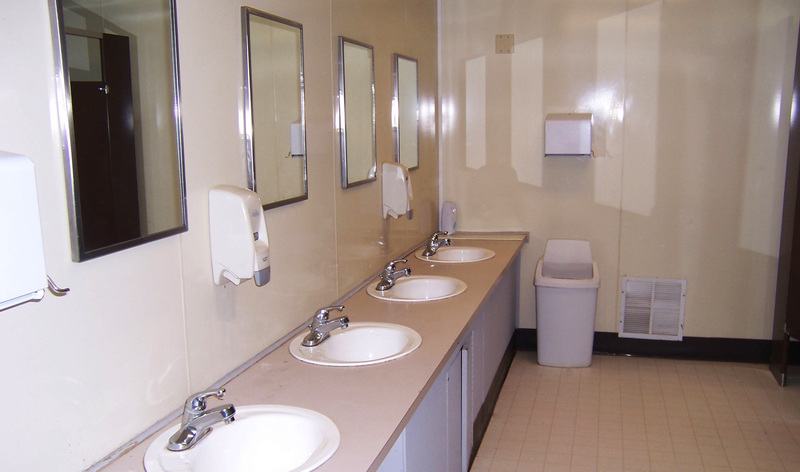 Mahaffey offers daily service, maintenance and cleaning programs on all units. Gender-specific trailers with separate male and female entrances are provided upon request. 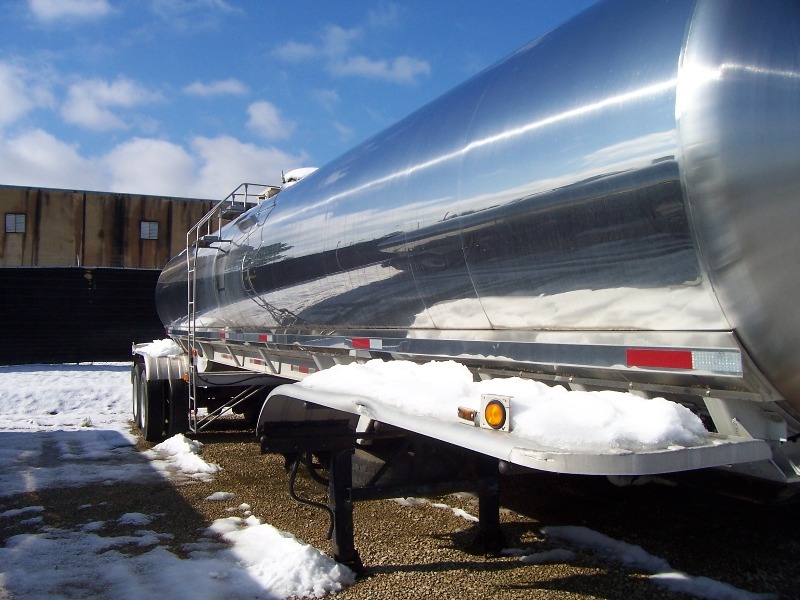 Mahaffey provides water supply, storage and disposal-using options from tankers to bladders depending on the location and requirements. All temporary systems are designed with your site-specific needs in mind, taking distance and elevation into account. Water systems can be as simple as providing water for a shower unit or maintaining water and waste disposal for showerheads, laundry facilities and kitchen operations all at the same time. 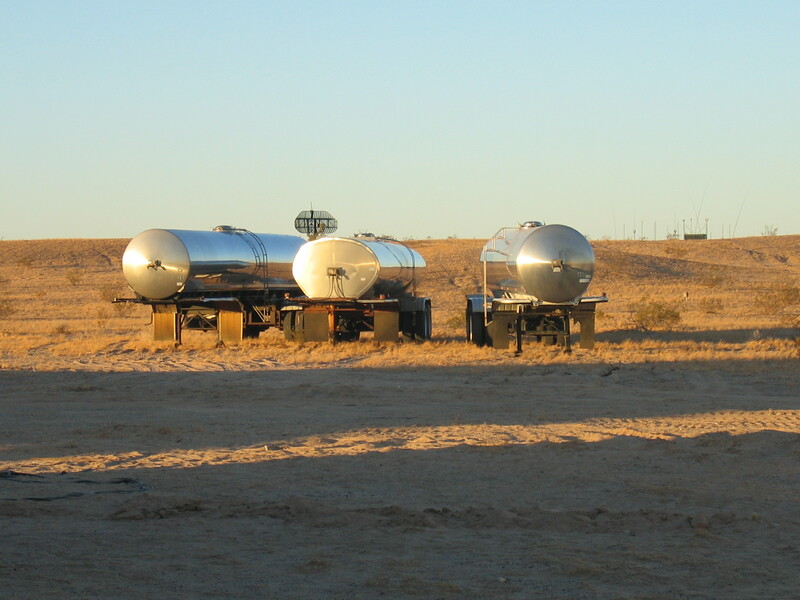 Potable water tankers with a capacity of 6,500 gallons and Mahaffey’s bladder system allow for water storage in areas where truck access is limited. Each bladder will store 3,500 gallons of potable water onsite and can be filled with pumps and hoses. Mahaffey has the capability to store greywater from laundry and shower trailers in either a bladder system or tanker which can be pumped to trucks for disposal. Greywater bladders have a capacity of 2,500 gallons each, and tankers have a capacity of 6,500 gallons. 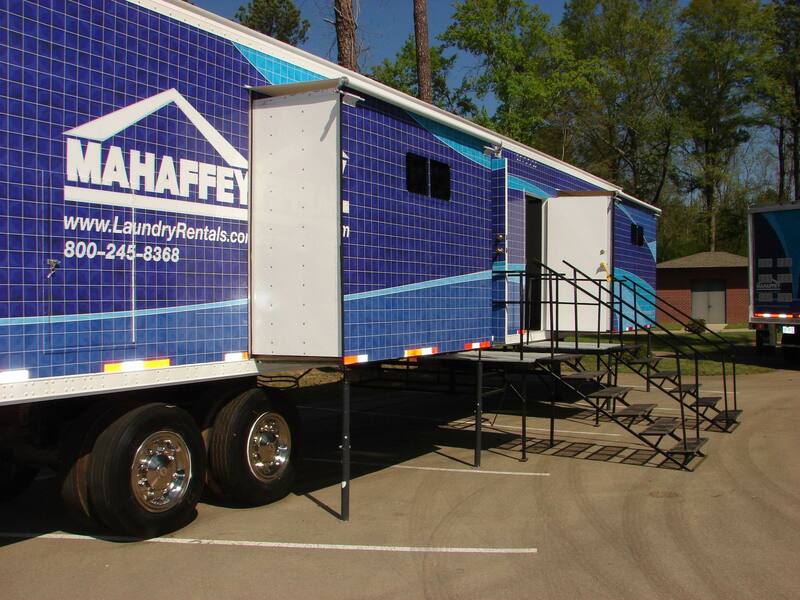 Mahaffey can provide portable laundry trailers for smaller projects or tented laundry facilities for those of larger scale. Optional services include a clean and fold drop-off service with a guaranteed 24-hour turnaround. 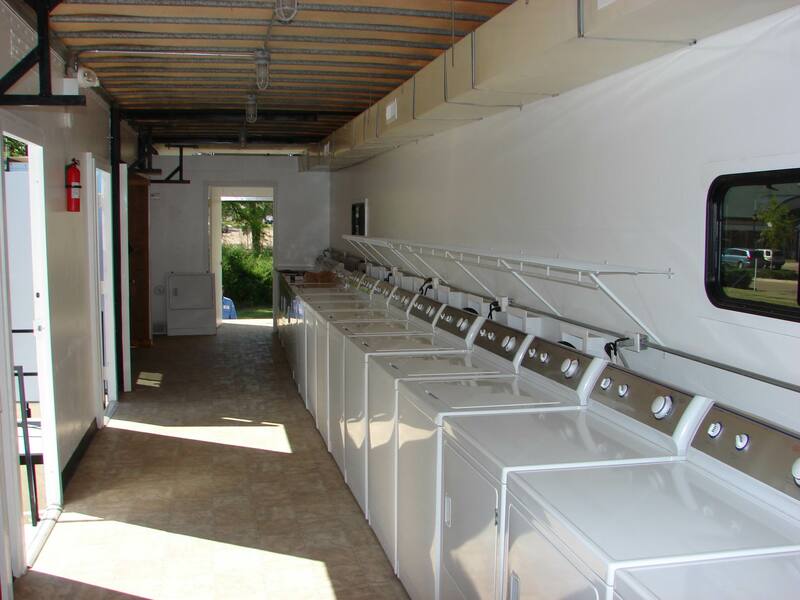 Laundry facilities can utilize existing municipal water and sewer connections or can be fitted with our storage tanks, bladders and pumps for applications where no utilities are available.